I have mixed emotions while writing this post. I'm sad to sell our first home, but super excited to be moving on to something even better! We bought our house 2.5 years ago and made some major changes to the front and back of the house. The interior didn't change much, we just painted all the walls, added some window coverings, a few new exterior doors, and put brass drawer pulls in the kitchen. Our house is featured on Green Wedding Shoes! I'm so excited because Green Wedding Shoes is featuring our home tour on their blog today! It's always fun to see all of our hard work displayed in such a fun way. Head over to the blog and check it out! And see more of my home decor posts here. Iam obsessed with anything marble (I mean who isn't these days), so I knew that's what I wanted for our coffee table. Sadly marble coffee tables are hundreds of dollars and I wasn't about to spend that kind of money. So I searched on Craigslist for a marble table that we could tear apart. I luckily found this one in Alameda! Our living room is the culmination of our mid century modern style meets antiques meets boho. The biggest thing was to paint the room white, and then we could bring everything in. We started the room with our large Joybird sectional and we worked around that. When figuring out the layout of this room we basically had two options for which wall would be the TV wall. There was an in wall plug for the TV already, on the wall it's now on, so we decided that made the most sense. Plus the way we have our couch allows for an "entry" area into the house where we put a long rug, a mirror and plant hanging on that wall. This room started as a tan box, so of course I painted it ALL white. A nice, cool white with no warm tones. We slowly got furniture for it, as we'd been sleeping on our mattress on the floor in our last few houses and also didn't have nightstands. The mid century modern dresser was a find from Craigslist when we lived in SLO, and we refinished it to have a darker stain compared to the red one it came with. When we bought the house last April, the first thing you noticed inside and outside was that the color tan threw up everywhere. We are so not tan paint people, give us cool neutrals, like grey and white, and pops of color like an orange front door and a dark blue house. The mid century modern style is our vibe (if you hadn't noticed yet), so we wanted to bring that to our not so mid century modern looking house. It's time to start revealing the Poff Pad! I decided to start with our backyard renovation because it's the most drastic change. It started off with a deck, real grass, tons of tan bark, some plants, and 2 old doors that led out to the backyard. We wanted to make as much usable space as we could, as well as keep it low maintenance. The mid century modern/Palm Springs vibe was our inspiration, and after looking at countless images online, we came up with this design. 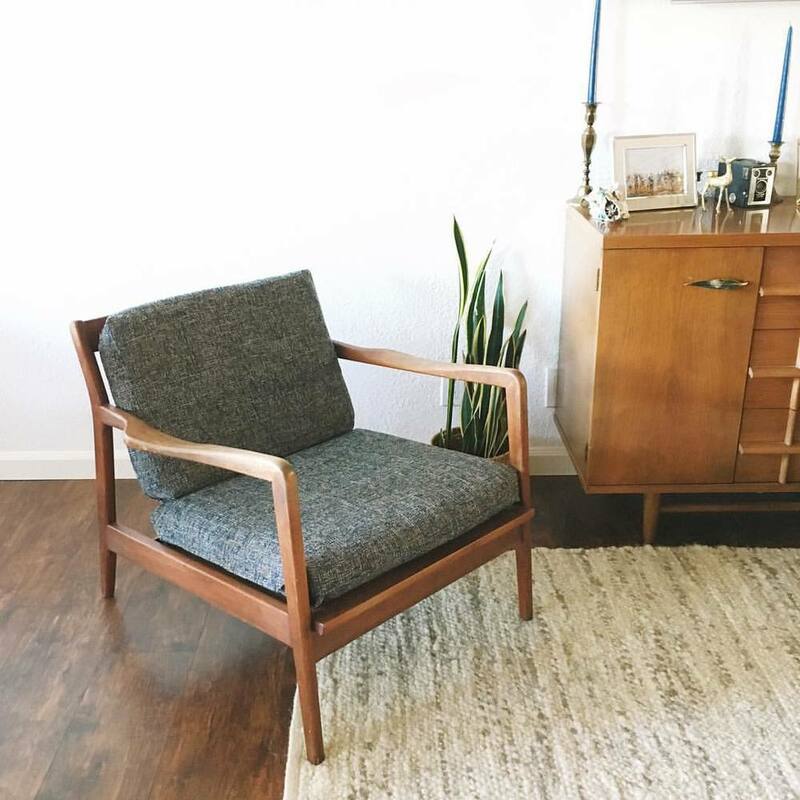 I bought this mid century modern chair at a thrift store for $80. I then purchased fabric from Joybird to recover the cushions with. It looks like a totally different chair and I love it!! These types of chairs can go for $500+ so finding this was a steal!